Tony Robbins is awesome. He is probably the most well known motivational speaker, and was great in the movie Shallow Hal. Here is a short clip where he discusses how your state and rituals effects your success in life. 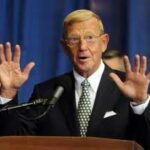 I am a huge Lou Holtz fan. His motivational speeches are awesome. He has a passion for life that is infectious and is a wonderful example on leadership. I saw Krish Dhanam speak not too long ago. To be honest, I had never heard of him before that day. Simply put, he is one of the best speakers I have ever had the privilege of hearing. He is hilarious and gives a great message. Watching his presentation will be the best 30 minutes you spend today. Nick Vujicic was born without arms or legs. The video below is his story – a story about how he overcame his challenges with a superior attitude. What an amazing inspiration. In my presentation tonight at Pi Lambda Phi’s National Convention, I discuss five leadership lessons. My second lesson is ‘Handle Adversity with Class’. This is a fantastic story of cross-country runner Ben Comen with cerebral palsy. How this kid handles his adversity is absolutely awesome. I am in awe with his heart and determination. The video below is long, but is one of the best hours you will ever spend. I served in the Air Force for five years. I deployed twice to the Middle East. My first deployment was to Iraq for five months. During those five months we were attacked by enemy mortars nearly every day. My second deployment was to Kuwait for six months, and it wasn’t nearly as hairy as the first. Jason McElwain is autistic. However, he probably is the owner of the most awesome four minutes of high school basketball in history. This video is a must-see. David Stollman from CAMPUSPEAK is a fantastic speaker. We recently spoke, and I could remember parts of his presentation from the only time I heard him speak – 10 years ago! If you ever get a chance to hear one of his presentations – you need to take advantage of that opportunity. I went to NC State, and obviously a huge Jim Valvano fan. If this video doesn’t motivate you, then nothing will. I’ll be honest with you, I was not a Will Smith fan before I saw this video. However, it is hard to not like a guy who has this much passion for life. Someone better find out what school this kid is going to and recruit him. This might be the most brilliant use of the internet ever.